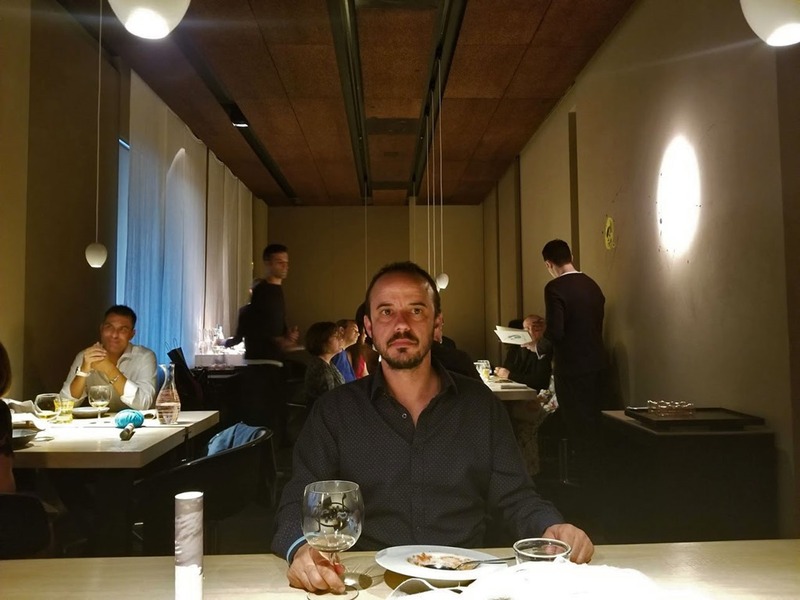 For me, the biggest challenge in fully appreciating tasting menus is the pace, even in dining rooms where the wait staff and kitchen are sensitive about the timing of the meal. It is difficult to taste each dish carefully, to understand how all the ingredients interact, to reflect on the emotional expression of the dish and how it exemplifies the chef’s style, and to write all that down for future reference all in the few minutes in which the dish is in front of you (and still hot if it’s a cooked dish). Add to that an appreciation of how the wine pairings are working while carrying on conversation with dinner companions and leaving time for pure enjoyment– it feels like a hectic day at work instead of a consummate aesthetic experience. This is why restaurant reviews are usually just lists of ingredients with an adjective or two. Perhaps each dish should come with an information card with detailed accounts of the chef’s intention as an entrée into the meaning of the dish. 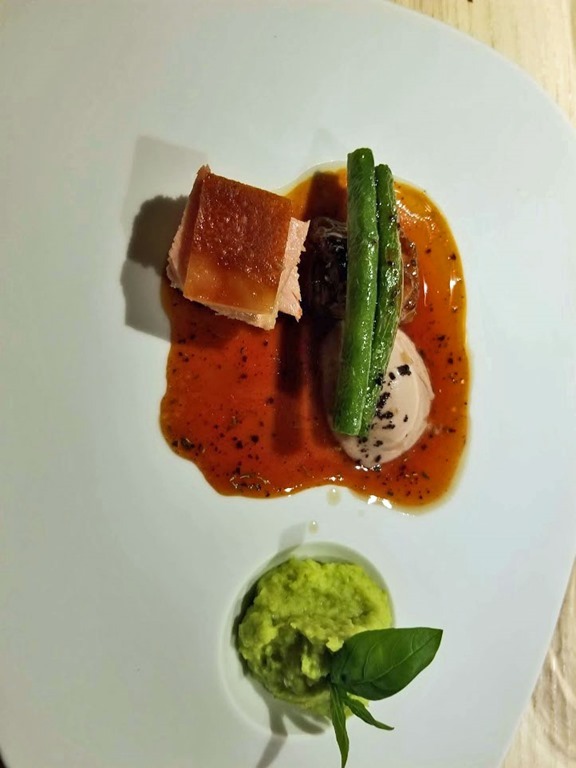 Le Calandre is a 3-star Michelin restaurant just outside of Padua, Italy, on some lists among the top 40 restaurants in the world. I was fortunate to get reservations there last summer and was, as usual, faced with this dilemma about how to fully appreciate the meal. This time I was rescued by a mighty tome written by Chef Massimiliano Alajmo available for purchase at the restaurant. 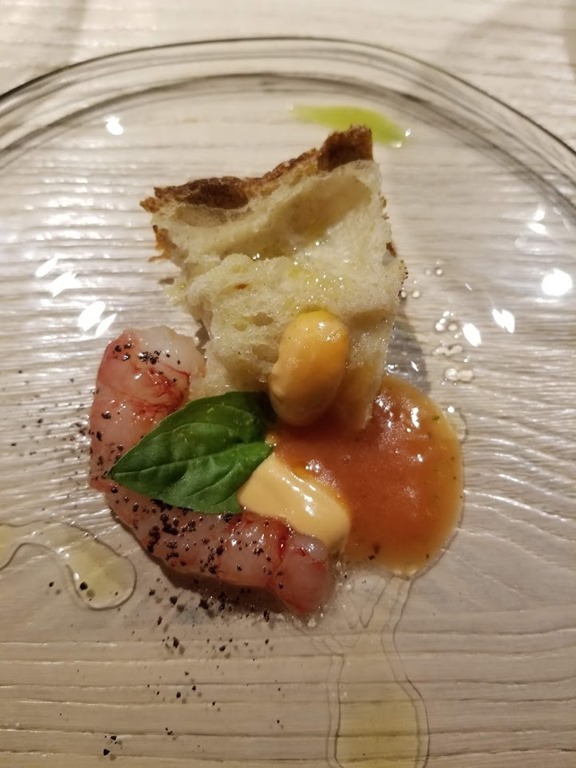 It included not just recipes but conceptualizations of many of the dishes we were served that evening, along with a dialogue that goes into some detail about how he thinks about his compositions. Of course, I didn’t spend the evening reading a book. The meal was delicious and interesting, and thanks to photos, a few notes and a subsequent reading of the book I’m still “tasting” the meal. It was clear from the beginning that coffee wasn’t the motive. The motive as an attempt to enter into contact, or even better to communicate with the intimate part of the ingredient because nobility is intrinsic in all true and genuine elements. In them we have two components: the essential and formal parts. The essential is interior and animated. The formal is exterior and obvious, and is passive in comparison. In other words, the ingredient is the way we view it but an in-depth study is the way we communicate with it. We elevate each element through understanding with comprehensive examination not limited to the exterior….Above all, to penetrate an ingredient means to go beyond the sensorial level (sight, touch, taste…) unleashing a metaphorical charge. The symbols bound to the elements also stimulate us to search within ourselves. This is how one grows, and learns, for example, not to be limited by the palate’s simple pleasures because more profound and superior gratifications exist. There is a lot going on in this paragraph but I think it’s essentially right. To understand anything, including ingredients in a dish, we must understand the underlying forces at work, some of which are barely perceptible and some of which can only be accessed via feeling states. It’s the chef’s job to uncover them and make them perceptible. Some of these themes are exemplified in the tasting menu below. 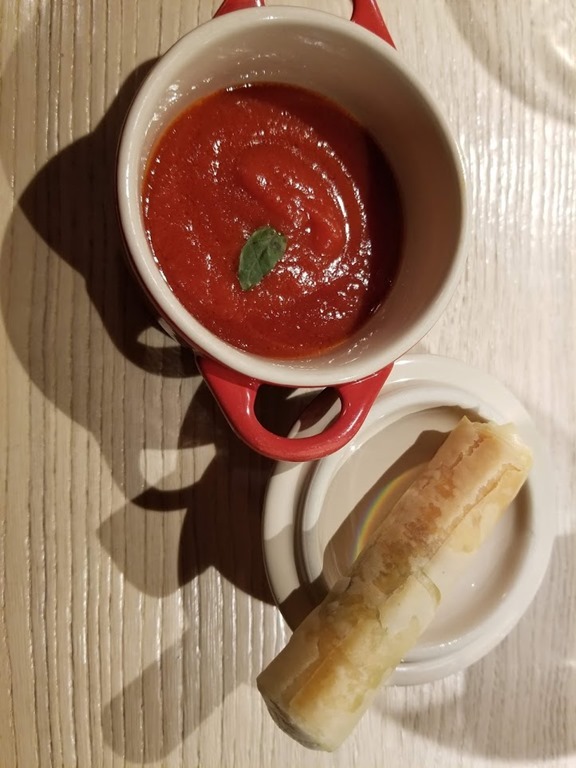 Italian food is noted for its simplicity. Although these recipes are not simple to prepare, they leave an impression of simplicity on the diner. The emphasis is on trying to pull out just a few intensely bright flavors in each dish. As far as I could tell there were few if any molecular techniques employed. 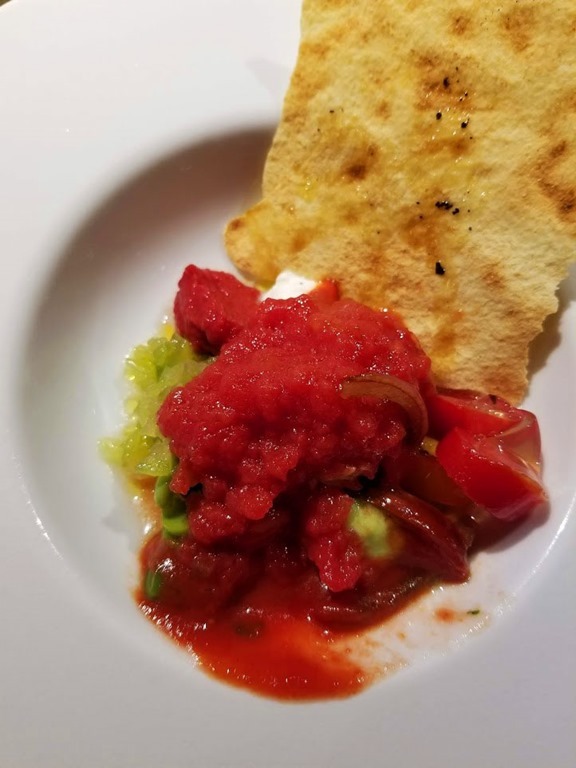 This is a dish of red tomato tartar, green tomato tartar, fava bean tartar, fava bean, green bean and basil salad, ricotta sauce and Sardinian flatbread. The dish exemplifies the concept of weaving with the three tartars exemplifying overlapping yet distinctive flavors. The colors also represent Italy’s tri-color flag, itself a weaving of the separate regions that formed the nation of Italy in the 19th Century. 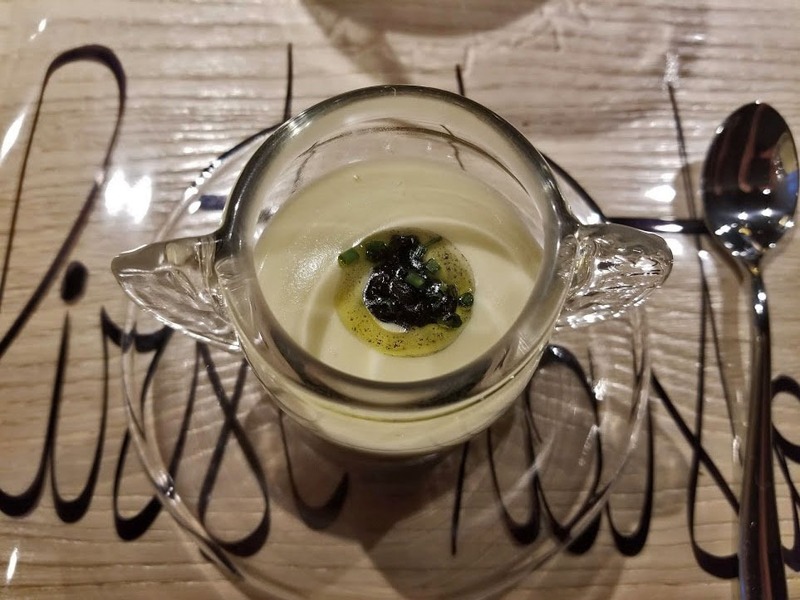 This dish consists of small cubes of squid and drops of squid ink in a potato cream served in layers in a vertical glass cup. A play on tiramasu and cappuccino, it comes with instructions to plunge the spoon straight down so the fusion of the layers occurs in the mouth. A simple, comforting, enveloping dish that exemplifies layering. Indeed the layers persist in the mouth even as the ingredients are fused. A variety of interpretations on fresh, especially the raw shrimp which was exceptionally fatty and vibrant. It came together with the wine, a St. Clair Sauvignon Blanc from Marlborough, which cut the fat of the shrimp. As with all the dishes that included cream, it was light almost weightless. The chef calls this an anomalous calzone which represents tactility. Crispy cylinders and creamy flavors, it’s clearly a dish meant to evoke childhood memories of pizza, all the senses working overtime. Of course the tomato sauce was glowing. Very aromatic, the fresh pasta freshly smoked and paired with a unique, Sicilian dry Moscato with a distinct smoke note as well. Despite all the smoke, the dish was light and multi-dimensional, a very deft hand with an ingredient that can overpower. The saffron and licorice represents the extreme parts of a plant, root and flower, a dialogue between opposites. This dish is often served with licorice powder but in this case the licorice sorbet was brilliant, a thrilling contrast between hot and cold. Saffron and fennel, with its anise aromas, are a classic flavor pairing. This dish takes that concept in a new direction. Velvety, hand chopped beef . 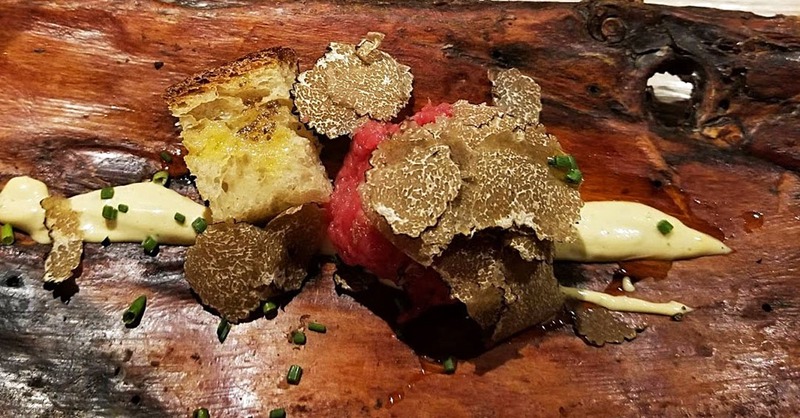 Another dish of very fresh tasting fat with a wonderful fusion of truffle and anise aroma. Roasted beet with burnt herbs. The only dish that didn’t quite work for me. It was basically a well-roasted beet. Nice, attractively presented, but not intriguing. Crisp, suckling pig with olive sorbet, grean beans, and pea puree. Once again the hot/cold contrast was a theme that amps up the intensity of the dish. 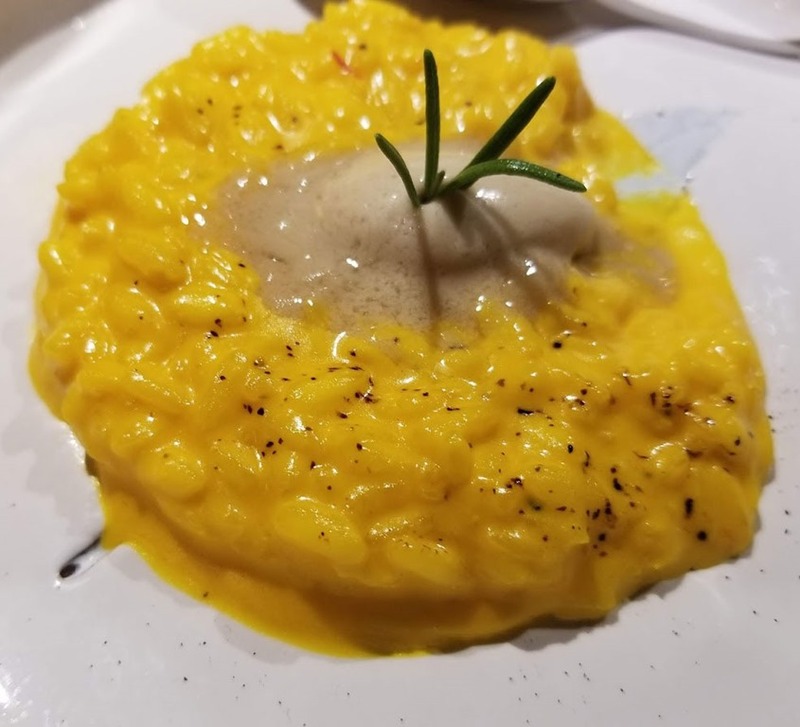 Served with a bright, fresh, slightly bitter Amarone. For dessert #1, an apparently empty dinner bowl was place in front of us. I just sat there waiting for the food to show up. But at the behest of the waiter, I finally flipped it over to reveal a creme brûlée in the bottom of the plate covered with a layer of gold leaf. And finally a chocolate and hazelnut cannellone with hot chocolate foam finished the meal. A delicious meal made more memorable by the chef’s attempt to put in words flavors too easily forgotten. Of course I was accompanied in this culinary adventure by legal counsel. My accountant, however, had fallen ill and could not attend.